No visit to Salzburg, Austria - where much of the 1965 film "The Sound of Music" was filmed - can be complete without running through a field of spring flowers in a frilly dress, arms raised overhead, singing "...these are a few of my FAVORITE things!" O.K., technically, it didn't happen quite that way for me on my recent trip to this glorious European city, but one place I visited while there did bring together several of my "favorite things." If I were to write down a list of those "favorite things," at or near the top would be (a) airplanes, (b) race cars, (c) great food, (d) contemporary architecture and (e) modern art. So it was with a great deal of satisfaction that I found every one of these elements when I stepped inside Red Bull's Hangar-7, which sits across from the terminal at the Salzburg Airport. As I planned my visit to Austria, we selected Salzburg over Vienna on the recommendation of a good family friend who is Austrian, and the decision proved to be a good one. 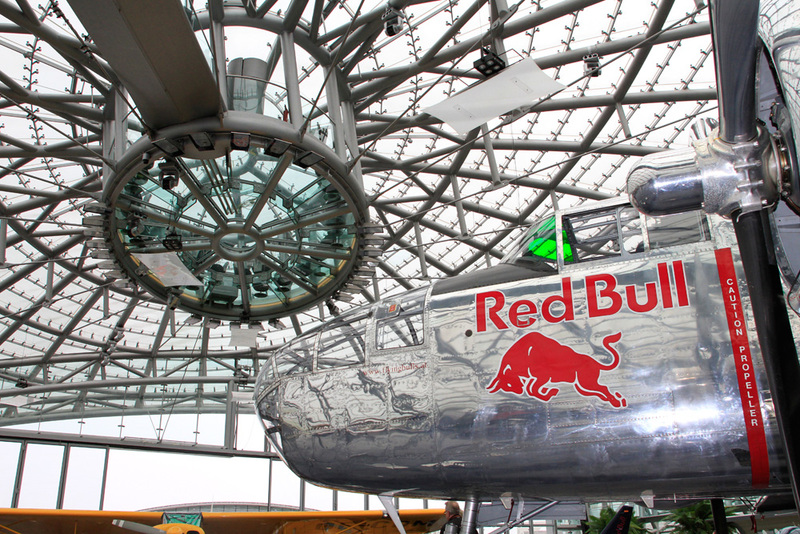 In doing some research on what to do/see while in Salzburg, as an #Avgeek, you can imagine my elation when I learned the Flying Bulls Collection was based right at the airport. With a few hours to kill between arrival at SZG and check-in at our hotel (which was built in 1342...wrap your head around THAT), a stop at Hangar-7 seemed like a great idea. We tried without success to translate the Salzburg bus system schedule, because being "in country" for about 30 minutes, we had yet to pick up much useable verbiage of the Austrian language. I asked a bus driver if his bus was going to "Hangar-7" and received a blank stare back. But when I asked if he knew which bus could take me to "Red Bull," he sort of grunted and pointed to the back of the bus. My traveling partner and wife, Julie, knew nothing of Hangar-7 or the aviation eye candy that is housed within. But like me, she loves great contemporary architecture, and as we approached this futuristic monument to shiny airplanes - and very small but highly profitable cans of caffeine-infused energy liquid - I could tell her excitement level was rising. Sigi Angerer, a Tyrolean Airways pilot, was looking for a reasonably-priced warbird, and came across a North American T-28B, which he had transported to Innsbruck and restored. This was quickly followed by a Grumman G-44 Widgeon and finally by the legendary Chance Vought F4U-4 "Corsair". The Corsair brought together Angerer and Mateschitz, who identified the elegant airplanes as the perfect brand messenger for Red Bull's claim to "give you wings". The idea of the Flying Bulls was born. The fleet grew with the energy drink's global success. As there was soon not enough space at Innsbruck Airport, the fleet's original home, the idea of building a hangar at Salzburg Airport emerged in the late 1990s, with planning of this gorgeous multi-purpose building beginning in October 1999. Hangar-7, dedicated in August, 2003, has a main exhibit hall approximately 330-feet long, 220-feet wide and nearly 50-feet high. The hangar, with a footprint of 39,800 sq-ft, uses 1,754 glass panes weighing 380 tons. This futuristic design is held together by 12,800 three-directional pivot fastening points. What is so special about his facility is not just the collection of airplanes, Formula One race cars and modern art, but the two bars, a lounge and the restaurant Ikarus that is inside. A new Guest Chef is brought in each month to serve truly world-class cuisine in a setting like no other. It is very classy, with every detail taken to the highest of levels. The finest example of this is the gigantic floral arrangement shown in the photo at right. This is the women's restroom, and it is not an optical illusion. The bouquet of fresh flowers was in fact many feet higher than the chair next to it. This sort of thing is found everywhere you look at Hangar-7. You can't walk five feet inside this beautiful hall without coming within inches of either a perfectly-restored airplane, a "right off the track" Formula One race car, or something as amusing as the Red Bull X2010 S. Vettel. The centerpieces of the collection on the day I visited were the North American B-25J, Chance Vought F4U-4 Corsair and North American T-28B, with the Extra 300L, BD-5J Microjet, Eurocopter EC 135, Boeing PT-17 Stearman, Fairchild PT-19 M-62 A, Alpha Jet, Bell 47 G-3B-1, Bell Cobra TAH-1F and a sweet Piper J3 Cub filling out the floor. Not on display were the Lockheed P-38L, Douglas DC-6B, Cessna 337, Cessna 208 Amphibian, Bo105 helicopter, and Pilatus Turbo Porter PC-6/B2-H4. But anything in this collection is worth viewing. No matter what is in Hangar-7 on your arrival or what is out on the air show circuit somewhere in the world, your visit to the home of The Flying Bulls will put you in the center of an aviator's paradise. 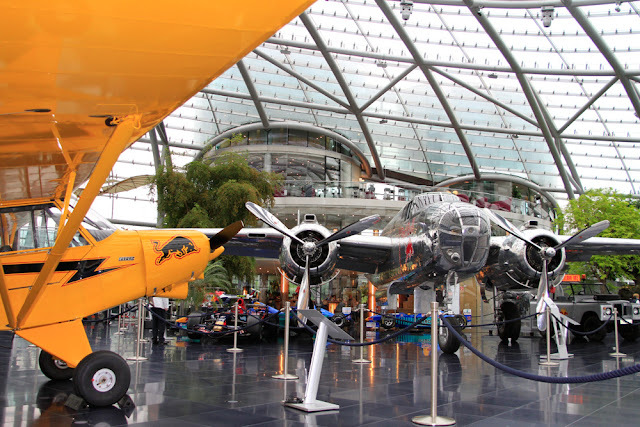 If you are planning a swing through Europe, and want to enjoy a lovely country with attractive, brilliant, congenial people, stop in Austria and make sure to visit Hangar-7. Bring your camera, but be prepared to agree to use those images for personal use only (I had to get written approval to post photos). It will be your new favorite place to spy perfect airplanes, eat food that will never be forgotten, and drink insanely good Austrian beers in a lounge that will leave you wondering how this all can get any better. You may somehow one day forget the shiny P-38, the cobalt blue Corsair, the DC-6 that blows thy mind or the multi-course feast you enjoyed in their midst. But you will never, ever forget the bathrooms. You simply have to go to Salzburg and see them for yourself. Any other rest room you use from then until your demise from this Earth will be shabby, boring and mundane by comparison. Many thanks to Marisa Rubenbauer of Red Bull's Marketing and Communication Department for help with this piece. Like everything in the world of Hangar-7 and The Flying Bulls, even their marketing is first-class. Seriously. The "Media Kit" I received was a collection of four gorgeous full-color books that tells the story of this sophisticated operation using collateral materials that puts anything this veteran marketer has seen before to shame. I would probably have had to spend €75 in their store to buy these books, but Rubenbauer apparently saw the importance of helping an American aviation writer she had never met before. To say I was impressed with the welcome I received at Hangar-7 would be a gross understatement. If this place is not on your Aviation Bucket List, then that list is not yet complete.